Age: This rather small and compact gull displays a full tailband and brown-washed wing coverts. We can feel safe aging it as a 1st cycle. Of course extended views would be desired to better age our gull. Identification: There's no question that this is a hooded species. Of note is the solid-patterned upperwing (right wing). It lacks a carpal bar, eliminating species such as Bonaparte's, Little and Black-headed. 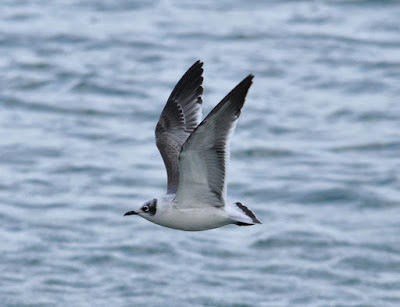 The bold eye crescents and semi-hooded appearance scream Franklin's Gull. Also supportive of Franklin's (over Laughing Gull) is the clean white wing linings and hind neck. If we zoom in, the tailband on Franklin's almost never reaches the outermost edge of the outer tail feathers, as is the case here. This 1st cycle Franklin's Gull was photographed in Chicago, Illinois. October.